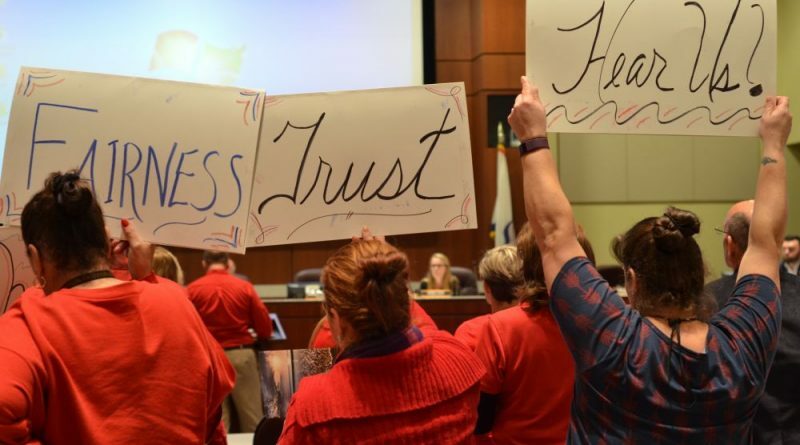 Loudoun County School Board members told frustrated bus drivers and parents who filed into the board room Tuesday night that their concerns have been heard. “We are taking this seriously,” School Board member Debbie Rose (Algonkian) said after hearing 15 speakers voice complaints about transportation issues. Most of the speakers were bus drivers who said morale in the Transportation Department has never been so low. They cited a lack of respect and pay that isn’t keeping pace with the rising costs of health benefits. The school system is short as many as 160 bus drivers. In the past two years, 203 bus drivers, substitute drivers, trainers and attendants have left, according to the school system. In that time, 132 have been hired on. Annie Grazier, a bus dispatcher, told board members they should not be surprised that so many drivers have left. Changes in how the division’s health insurance options has meant, for those who choose the more expensive of two coverage options, they take home less pay than 10 years ago. Grazier said, while Loudoun bus drivers’ starts at $18.10 an hour, UPS drivers start at $21 an hour, and Old Dominion pays $23 an hour. At least two speakers read statements from drivers too afraid to speak negatively about the job publically. The Student Support and Services Committee, which Rose chairs, is working with the Support Services Department to come up with incentives to retrain and recruit drivers and is taking another look at compensation and benefits offered to drivers. Several parents also addressed the board about the bus rides that, for some students, have reached 90 minutes a day because of the driver shortage. Susana Calley, a Middleburg parent, said solutions cannot wait until next school year. 1. The markets dictate whether we can staff positions. If pay is too low, we have shortages. If it’s too high, we have workers from other areas desperately trying to transfer in. 2. Clearly, school bus driver compensation is too low to even fill LCPS’ positions with qualified drivers. 3. We are way oversubscribed with teaching candidates. Talk to new graduates who find it hard to even get an interview to be a teacher at LCPS. 4. According to LCPS’ own stats, the number of teachers transferring from Fairfax and other districts into Loudoun is many times over the number that seek to transfer out of LCPS. Yet the board members with spouses say teacher pay is too low!!! They really just want to pocket money that should be going to drivers and maintenance. 5. LCPS Superintendent Eric Williams said it was “unacceptable” that the school board’s teacher spouses are not the highest paid teachers in all of Virginia. It’s no wonder that his contract says he has to promote the board members (not the students, mind you, the actual board members). What makes it all worse is that this board is required by law to declare any and all conflicts of interest when raising their spouse’s pay. Yet Commonwealth Attorney Plowman refuses to enforce the law to protect his friends on the board. None of these folks could care less about the drivers. They are looking to transfer all the pay into their own pockets and that of their friends.